This is “Negotiation of Commercial Paper”, chapter 20 from the book The Law, Corporate Finance, and Management (v. 1.0). For details on it (including licensing), click here. In the previous chapter, we took up the requirements for paper to be negotiable. Here we take up negotiation. Understand what a transfer of commercial paper is. Recognize the rights and liabilities of transferees and the liabilities of transferors. Know how a transfer becomes a negotiation payable to order or to bearer. A person can become holder of an instrument when the instrument is issued to that person, or the status of holder can arise as the result of an event that occurs after issuance. “Negotiation” is the term used in article 3 to describe this post-issuance event. Normally, negotiation occurs as the result of a voluntary transfer of possession of an instrument by a holder to another person who becomes the holder as a result of the transfer. Negotiation always requires a change in possession of the instrument because nobody can be a holder without possessing the instrument, either directly or through an agent. But in some cases the transfer of possession is involuntary and in some cases the person transferring possession is not a holder.…[S]ubsection (a) states that negotiation can occur by an involuntary transfer of possession. For example, if an instrument is payable to bearer and it is stolen by Thief or is found by Finder, Thief or Finder becomes the holder of the instrument when possession is obtained. In this case there is an involuntary transfer of possession that results in negotiation to Thief or Finder.Uniform Commercial Code, Section 3-201, Official Comment. In other words, to qualify as a holder, a person must possess an instrument that runs to her. An instrument “runs” to a person if (1) it has been issued to her or (2) it has been transferred to her by negotiation (negotiation is the “post-issuance event” cited in the comment). Commercially speaking, the status of the immediate person to whom the instrument was issued (the payee) is not very interesting; the thing of interest is whether the instrument is passed on by the payee after possession, through negotiation. Yes, the payee of an instrument is a holder, and can be a holder in due course, but the crux of negotiable instruments involves taking an instrument free of defenses that might be claimed by anybody against paying on the instrument; the payee would know of defenses, usually, so—as the comment puts it—“use of the holder-in-due-course doctrine by the payee of an instrument is not the normal situation.…[r]ather, the holder in due course is an immediate or remote transferee of the payee.”Uniform Commercial Code, Section 3-302, Comment 4. We discuss liability in Chapter 22 "Liability and Discharge". However, a brief introduction to liability will help in understanding the types of indorsements discussed in this chapter. There are two types of liability affecting transferors: contract liability and warranty liability. Persons who sign the instrument—that is, makers, acceptors, drawers, indorsers—have signed a contract and are subject to contract liabilities. Drafts (checks) and notes are, after all, contracts. Makers and acceptors are primary parties and are unconditionally liable to pay the instrument. Drawers and indorsers are secondary parties and are conditionally liable. The conditions creating liability—that is, presentment, dishonor, and notice—are discussed in Chapter 22 "Liability and Discharge". (1) The warrantor is a person entitled to enforce the instrument. (2) All signatures on the instrument are authentic and authorized. (3) The instrument has not been altered. (4) The instrument is not subject to a defense or claim in recoupment of any party which can be asserted against the warrantor. (5) The warrantor has no knowledge of any insolvency proceeding commenced with respect to the maker or acceptor or, in the case of an unaccepted draft, the drawer. Breach of one of these warranties must be proven at trial if there is no general contract liability. The transferee takes by assignment; as an assignee, the new owner of the instrument has only those rights held by the assignor. Claims that could be asserted by third parties against the assignor can be asserted against the assignee. A negotiable instrument can be transferred in this sense without being negotiated. A payee, for example, might fail to meet all the requirements of negotiation; in that event, the instrument might wind up being merely transferred (assigned). When all requirements of negotiability and negotiation have been met, the buyer is a holder and may (if a holder in due course—see Chapter 21 "Holder in Due Course and Defenses") collect on the instrument without having to prove anything more. But if the instrument was not properly negotiated, the purchaser is at most a transferee and cannot collect if defenses are available, even if the paper itself is negotiable. Negotiation can occur with either bearer paper or order paper. An instrument payable to bearer—bearer paperA negotiable instrument payable to whoever has possession.—can be negotiated simply by delivering it to the transferee (see Figure 20.1 "Negotiation of Bearer Paper"; recall that “Lorna Love” is the proprietor of a tennis club introduced in Chapter 19 "Nature and Form of Commercial Paper"): bearer paper runs to whoever is in possession of it, even a thief. Despite this simple rule, the purchaser of the instrument may require an indorsement on some bearer paper anyway. You may have noticed that sometimes you are requested to indorse your own check when you make it out to cash. That is because the indorsement increases the liability of the indorser if the holder is unable to collect. Chung v. New York Racing Association (Section 20.4 "Cases") deals with issues involving bearer paper. Negotiation is usually voluntary, and the issuer usually directs payment “to order”—that is, to someone’s order, originally the payee. Order paperNegotiable instrument that by its term is payable to a specified person or his or her assignee (as opposed to bearer paper). is this negotiable instrument that by its term is payable to a specified person or his assignee. If it is to continue its course through the channels of commerce, it must be indorsed—signed, usually on the back—by the payee and passed on to the transferee. Continuing with the example used in Chapter 19 "Nature and Form of Commercial Paper", Rackets, Inc. (the payee) negotiates Lorna Love’s check (Lorna is the issuer or drawer) drawn to the order of Rackets when an agent of Rackets “signs” the company’s name on the reverse of the check and passes it to the indorsee, such as the bank or someone to whom Rackets owed money. (A company’s signature is usually a rubber stamp for mere deposit, but an agent can sign the company name and direct the instrument elsewhere.) The transferee is a holder (see Figure 20.2 "Negotiation of Order Paper"). Had Rackets neglected to indorse the check, the transferee, though in physical possession, would not be a holder. Issues regarding indorsement are discussed in Section 20.2 "Indorsements". A transfer is the physical delivery of an instrument with the intention to pass title—the right to enforce it. A mere transferee stands in the transferor’s shoes and takes the instrument subject to all the claims and defenses against paying it that burdened it when the transferor delivered it. Negotiation is a special type of transfer—voluntary or involuntary—to a holder. A holder is a person who has an instrument drawn, issued, or indorsed to him or his order or to bearer or in blank. If the instrument is order paper, negotiation is accomplished by indorsement and delivery to the next holder; if it is bearer paper or blank paper, delivery alone accomplishes negotiation. Transferors incur two types of liability: those who sign the instrument are contractually liable; those who sign or those who do not sign are liable to the transferee in warranty. What is a transfer of commercial paper, and what rights and liabilities has the transferee? What is a negotiation of commercial paper? How is bearer paper negotiated? How is order paper negotiated? There are rules about where indorsements are placed. The Expedited Funds Availability Act was enacted in 1987 by Congress to standardize holding periods on deposits made to commercial banks and to regulate institutions’ use of deposit holds—that is, how soon customers can access the money after they have deposited a check in the bank. The Federal Reserve Board subsequently adopted “Regulation CC, Check Endorsement Standards” to improve funds availability and expedite the return of checks. See Figure 20.3 "Indorsement Standard". 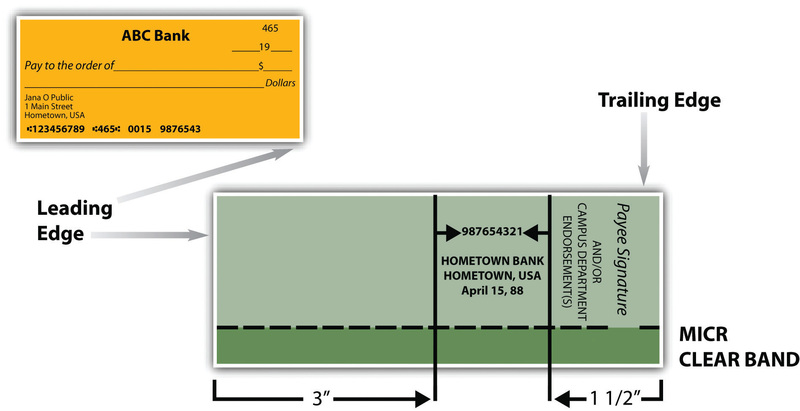 As shown in Figure 20.3 "Indorsement Standard", specific implementing guidelines define criteria for the placement, content, and ink color of endorsement areas on the back of checks for the depositary bank (bank of first deposit), subsequent indorsers (paying banks), and corporate or payee indorsers. Indorsements must be made within 1½ inches of the trailing (left) edge of the back of the check; remaining space is for bank indorsements. There is no penalty for violating the standard—it is a guideline. The abbreviation “MICR” stands for magnetic ink character recognition. The “clear band” is a section of the back of the check that is not supposed to be intruded upon with any magnetic (machine-readable) printing that would interfere with machine reading on the front side (the bank routing numbers). A blank indorsementIndorsement of a check or other negotiable paper without naming a further indorsee (usually simply the indorser’s name). consists of the indorser’s signature alone (see Figure 20.4 "Forms of Endorsement", left). A blank indorsement converts the instrument into paper closely akin to cash. Since the indorsement does not specify to whom the instrument is to be paid, it is treated like bearer paper—assuming, of course, that the first indorser is the person to whom the instrument was payable originally. A paper with blank indorsement may be negotiated by delivery alone, until such time as a holder converts it into a special indorsement (discussed next) by writing over the signature any terms consistent with the indorsement. For example, a check indorsed by the payee (signed on the back) may be passed from one person to another and cashed in by any of them. A special indorsementIndorsement that names the transferee-holder., sometimes known as an “indorsement in full,” names the transferee-holder. The payee of a check can indorse it over to a third party by writing “Pay to the order of [name of the third party]” and then signing his name (see Figure 20.4 "Forms of Endorsement", center). Once specially indorsed, the check (or other instrument) can be negotiated further only when the special indorsee adds his own signature. A holder may convert a blank indorsement into a special indorsement by writing above the signature of the indorser words of a contractual nature consistent with the character of the instrument. A restrictive indorsementIndorsement specifying the use to which an instrument may be put; most common is “For deposit only.” attempts to limit payment to a particular person or otherwise prohibit further transfer or negotiation. We say “attempts to limit” because a restrictive indorsement is generally invalid. Section 3-206(a) of the UCC provides that an attempt to limit payment to a particular person or prohibit further transfer “is not effective.” Nor is “[a]n indorsement stating a condition to the right of the indorsee to receive payment”; the restriction may be disregarded. However, two legitimate restrictive indorsements are valid: collection indorsements and trust indorsements. Wisner Elevator Company, Inc. v. Richland State Bank (Section 20.4 "Cases") deals with conditional and restrictive indorsements. It is very common for people and businesses to mail checks to their bank for deposit to their accounts. Sometimes mail goes astray or gets stolen. Surely it must be permissible for the customer to safeguard the check by restricting its use to depositing it in her account. A collection indorsementIndorsement restricting payment to collection or deposit., such as “For deposit” or “For collection,” is effective. Section 3-206(c) of the UCC provides that anybody other than a bank who purchases the instrument with such an indorsement converts the instrument—effectively steals it. A depositary bank that takes it must deposit it as directed, or the bank has converted it. A payor bank that is also the depositary bank that takes the instrument for immediate payment over the counter converts it: the check cannot be cashed; it must be deposited (see Figure 20.4 "Forms of Endorsement"). To illustrate, suppose that Kate Jones indorses her paycheck “For deposit only, Kate Jones,” which is by far the most common type of restrictive indorsement (see Figure 20.4 "Forms of Endorsement", right). A thief steals the check, indorses his name below the restrictive indorsement, and deposits the check in Last Bank, where he has an account, or cashes it. The check moves through the collection process to Second Bank and then to First Bank, which pays the check. Kate has the right to recover only from Last Bank, which did not properly honor the indorsement by depositing the payment in her account. Recognize under what circumstances a negotiation is subject to rescission. Know the effect of reacquisition of an instrument. Understand how instruments made payable to two or more persons are negotiated. Understand how the UCC treats forged indorsements, imposters, and other signatures in the name of the payee. A number of problems commonly arise that affect the negotiation of commercial paper. Here we take up three. A negotiation—again, transfer of possession to a person who becomes a holder—can be effective even when it is made by a person without the capacity to sign. Section 3-202(a) of the UCC declares that negotiation is effective even when the indorsement is made by an infant or by a corporation exceeding its powers; is obtained by fraud, duress, or mistake; is part of an illegal transaction; or is made in breach of a duty. Subsection (a) applies even though the lack of capacity or the illegality is of a character which goes to the essence of the transaction and makes it entirely void. It is inherent in the character of negotiable instruments that any person in possession of an instrument which by its terms is payable to that person or to bearer is a holder and may be dealt with by anyone as a holder. The principle finds its most extreme application in the well-settled rule that a holder in due course may take the instrument even from a thief and be protected against the claim of the rightful owner. The policy of subsection (a) is that any person to whom an instrument is negotiated is a holder until the instrument has been recovered from that person’s possession.Uniform Commercial Code, Section 3-404, Official Comment 1. So suppose a mentally incapacitated person under a guardianship evades her guardian, goes to town, and writes a check for a new car. Normally, contracts made by such persons are void. But the check is negotiable here. If the guardian finds out about the escapade before the check leaves the dealer’s hands, the deal could be rescinded: the check could be retrieved and the car returned. A prior party who reacquires an instrument may reissue it or negotiate it further. But doing so discharges intervening parties as to the reacquirer and to later purchasers who are not holders in due course. Section 3-207 of the UCC permits the reacquirer to cancel indorsements unnecessary to his title or ownership; in so doing, he eliminates the liability of such indorsers even as to holders in due course. A note or draft can be payable to two or more persons. In form, the payees can be listed in the alternative or jointly. When a commercial paper says “Pay to the order of Lorna Love or Rackets, Inc.,” it is stated in the alternative. Either person may negotiate (or discharge or enforce) the paper without the consent of the other. On the other hand, if the paper says “Pay to the order of Lorna Love and Rackets, Inc.” or does not clearly state that the payees are to be paid in the alternative, then the instrument is payable to both of them and may be negotiated (or discharged or enforced) only by both of them acting together. The case presented in Section 20.4 "Cases", Wisner Elevator Company, Inc. v. Richland State Bank, deals, indirectly, with instruments payable to two or more persons. When a check already made out to a payee is stolen, an unscrupulous person may attempt to negotiate it by forging the payee’s name as the indorser. Under UCC Section 1-201(43), a forgery is an “unauthorized signature.” Section 3-403(a) provides that any unauthorized signature on an instrument is “ineffective except as the signature of the unauthorized signer.” The consequence is that, generally, the loss falls on the first party to take the instrument with a forged or unauthorized signature because that person is in the best position to prevent the loss. Lorna Love writes a check to Steve Supplier on her account at First State Bank, but the check goes astray and is found by Carl Crooks. Crooks indorses the check “Steve Supplier” and presents it for cash to a busy teller who fails to request identification. Two days later, Steve Supplier inquires about his check. Love calls First State Bank to stop payment. Too late—the check has been cashed. Who bears the loss—Love, Supplier, or the bank? The bank does, and it must recredit Love’s account. The forged indorsement on the check was ineffective; the bank was not a holder, and the check should not have been allowed into the channels of commerce. This is why banks may retain checks for a while before allowing access to the money. It is, in part, what the Expedited Funds Availability Act (mentioned in Section 20.2 "Indorsements", “Indorsements”) addresses—giving banks time to assess the validity of checks. The loss for a forged indorsement usually falls on the first party to take the instrument with a forged signature. However, there are three important exceptions to this general rule: the imposter rule, the fictitious payee rule, and the dishonest employee rule. If one person poses as the named payee or as an agent of the named payee, inducing the maker or drawer to issue an instrument in the name of the payee to the imposter (or his confederate), the imposter’s indorsement of the payee’s name is effective. The paper can be negotiated according to the imposter ruleRule stating that if an impostor endorses a negotiable instrument and receives payment in good faith, the drawer of the instrument is responsible for the loss.. If the named payee is a real person or firm, the negotiation of the instrument by the imposter is good and has no effect on whatever obligation the drawer or maker has to the named payee. Lorna Love owes Steve Supplier $2,000. Knowing of the debt, Richard Wright writes to Love, pretending to be Steve Supplier, requesting her to send a check to Wright’s address in Supplier’s name. When the check arrives, Wright indorses it by signing “Pay to the order of Richard Wright, (signed) Steve Supplier,” and then indorses it in his own name and cashes it. Love remains liable to Steve Supplier for the money that she owes him, and Love is out the $2,000 unless she can find Wright. The difference between this case and the one involving the forger Carl Crooks is that in the second case the imposter (Wright) “induced the maker or drawer [Lorna Love] to issue the instrument…by impersonating the payee of the instrument [Steve Supplier]” (UCC, Section 3-404(a)), whereas in the first case the thief did not induce Love to issue the check to him—he simply found it. And the rationale for making Lorna Love bear the loss is that she failed to detect the scam: she intended the imposter, Wright, to receive the instrument. Section 3-404(c) provides that the indorsement of the imposter (Wright, posing as Steve Supplier) is effective. The same rule applies if the imposter poses as an agent: if the check is payable to Supplier, Inc., a company whose president is Steve Supplier, and an impostor impersonates Steve Supplier, the check could be negotiated if the imposter indorses it as Supplier, Inc.’s, agent “Steve Supplier.”Uniform Commercial Code, Section 3-404, Official Comment 1. Similarly, suppose Love is approached by a young man who says to her, “My company sells tennis balls, and we’re offering a special deal this month: a can of three high-quality balls for $2 each. We’ll send your order to you by UPS.” He hands her a sample ball: it is substantial, and the price is good. Love has heard of the company the man says he represents; she makes out a check for $100 to “Sprocket Athletic Supply.” The young man does not represent the company at all, but he cashes the check by forging the indorsement and the bank pays. Love takes the loss: surely she is more to blame than the bank. In the imposter cases, Love drew checks made out to real names but gave them to the wrong person (the imposter); in the fictitious payee cases she wrote checks to a nonexistent person (or a real person who was not intended to have any interest at all). The UCC takes head-on the recurring problem of a dishonest employee. It says that if an employer “entrust[s] an employee with responsibility with respect to the instrument and the employee or a person acting in concert with the employee makes a fraudulent indorsement of the instrument, the indorsement is effective.”Uniform Commercial Code, Section 3-405(B). For example (adapted from UCC 3-405, Official Comment 3; the Comment does not use the names of these characters, of course), the duties of Abby Accountant, a bookkeeper, include posting the amounts of checks payable to Lorna Love to the accounts of the drawers of the checks. Accountant steals a check payable to Love, which was entrusted to Accountant, and forges Love’s indorsement. The check is deposited by Accountant to an account in the depositary bank that Accountant opened in the same name as Lorna Love, and the check is honored by the drawee bank. The indorsment is effective as Love’s indorsement because Accountant’s duties include processing checks for bookkeeping purposes. Thus Accountant is entrusted with “responsibility” with respect to the check. Neither the depositary bank nor the drawee bank is liable to Love for conversion of the check. The same result would follow if Accountant deposited the check in the account in the depositary bank without indorsement (UCC, Section 4-205(a)). Under Section 4-205(c), deposit in a depositary bank in an account in a name substantially similar to that of Lorna Love is the equivalent of an indorsement in the name of Lorna Love. If, say, the janitor had stolen the checks, the result would be different, as the janitor is not entrusted with responsibility regarding the instrument. Not surprisingly, though, if a person fails to exercise ordinary care and thereby substantially contributes to the success of a forgery, that person cannot assert “the alteration or the forgery against a person that, in good faith, pays the instrument or takes it for value.”Uniform Commercial Code, Section 4-406(a). If the issuer is also negligent, the loss is allocated between them based on comparative negligence theories. Perhaps the bank teller in the example about the tennis-ball scam should have inquired whether the young man had any authority to cash the check made out to Sprocket Athletic Supply. If so, the bank could be partly liable. Or suppose Lorna Love regularly uses a rubber signature stamp for her tennis club business but one day carelessly leaves it unprotected. As a result, the stamp and some checks are stolen; Love bears any loss for being negligent. Similarly liable is a person who has had previous notice that his signature has been forged and has taken no steps to prevent reoccurrences, as is a person who negligently mails a check to the wrong person, one who has the same name as the payee. The UCC provides that the negligence of two or more parties might be compared in order to determine whether each party bears a percentage of the loss, as illustrated in Victory Clothing Co., Inc. v. Wachovia Bank, N.A. (Section 20.4 "Cases"). A negotiation is effective even if the transaction involving it is void or voidable, but the transferor—liable on the instrument—can regain its possession and rescind the deal (except as to holders in due course or a person paying in good faith without notice). Instruments may be made payable to two or more parties in the alternative or jointly and must be indorsed accordingly. Generally, a forged indorsement is ineffective, but exceptions hold for cases involving imposters, fictitious payees, and certain employee dishonesty. If a person’s own negligence contributes to the forgery, that person must bear as much of the loss as is attributable to his or her negligence. A makes a check out to B for $200 for property both parties know is stolen. Is the check good? What is the difference between (a) the imposter rule, (b) the fictitious payee rule, and (c) the dishonest employee rule? How does comparative negligence work as it relates to forged indorsements? The defendant is a private stock corporation incorporated and organized in New York as a non-profit racing association pursuant to [New York law]. The defendant owns and operates New York’s largest thoroughbred racetracks—Belmont Park Racetrack, Aqueduct Racetrack, and Saratoga Racetrack—where it stages thoroughbred horse races and conducts pari-mutuel wagering on them pursuant to a franchise granted to the defendant by the State of New York. In addition to accepting bets placed at parimutuel facility windows staffed by facility employees, [some] facilities use SAMS. SAMS are automated machines which permit a bettor to enter his bet by inserting money, vouchers or credit cards into the machine, thereby enabling him to select the number or combination he wishes to purchase. A ticket is issued showing those numbers.Authors’ note: Pari-mutuel betting (from the French pari mutuel, meaning mutual stake) is a betting system in which all bets of a particular type are placed together in a pool; taxes and a house take are removed, and payoff odds are calculated by sharing the pool among all winning bets. When a voucher is utilized for the purpose of placing a bet at a SAMS machine, the SAMS machine, after deducting the amount bet by the horse player during the particular transaction, provides the horse player with, in addition to his betting ticket(s), a new voucher showing the remaining balance left on the voucher. In the instant case, the unfortunate horse player departed the SAMS machine with his betting tickets, but without his new voucher—showing thousands of dollars in remaining value—which he inadvertently left sitting in the SAMS machine. Within several minutes he realized his mistake and hurried back to the SAMS machine, only to find the voucher gone. He immediately notified a security guard. The defendant’s personnel thereafter quickly confirmed the plaintiff as the original purchaser of the lost voucher. The defendant placed a computerized “stop” on the voucher. However, whoever had happened upon the voucher in the SAMS machine and taken it had acted even more quickly: the voucher had been brought to a nearby track window and “cashed out” within a minute or so of the plaintiff having mistakenly left it in the SAMS machine. The plaintiff now sues the defendant, contending that the defendant should be liable for having failed to “provide any minimal protection to its customers” in checking the identity and ownership of vouchers prior to permitting their “cash out.” The defendant, in response, contends that the voucher consists of “bearer paper,” negotiable by anyone having possession, and that it is under no obligation to purchasers of vouchers to provide any such identity or ownership checks. If an instrument is payable to bearer…the possessor of the instrument will be a holder and, if he meets the other tests, a holder in due course. This is so even though the instrument may have passed through the hands of a thief; the holder in due course is one of the few purchasers in Anglo-Saxon jurisprudence who may derive a good title from a chain of title that includes a thief in its links. A person can become holder of an instrument…as the result of an event that occurs after issuance. “Negotiation” is the term used in Article 3 to describe this post-issuance event.…In defining “negotiation” former Section 3-202(1) used the word “transfer,” an undefined term, and “delivery,” defined in Section 1-201(14) to mean voluntary change of possession. Instead, subsections (a) and (b) [now] use the term “transfer of possession,” and subsection (a) states that negotiation can occur by an involuntary transfer of possession. For example, if an instrument is payable to bearer and it is stolen by Thief or is found by Finder, Thief or Finder becomes the holder of the instrument when possession is obtained. In this case there is an involuntary transfer of possession that results in negotiation to Thief or Finder. Thus, it would initially appear that under the prior Model Uniform Commercial Code, still in effect in New York, a thief or finder of bearer paper, as the recipient of an involuntary transfer, could not become a “holder,” and thus could not pass holder-in-due-course status, or good title, to someone in the position of the defendant. By stating that the Code’s terminology was “misleading,” the treatise appears to imply that despite the literal import of the words, the contrary was true—negotiation could be accomplished by involuntary transfer, i.e., loss or theft. In [Citation], the Appellate Division determined that the Tropicana Casino in New Jersey became a holder in due course of signed cashier’s checks with blank payee designations which a thief had stolen from the defendant and negotiated to the casino for value after filling in the payee designation with his brother-in-law’s name. The Appellate Division, assuming without discussion that the thief was a “holder” of the stolen instruments and therefore able to transfer good title, held the defendant obligated to make payment on the stolen checks. Accord [Citation] (check cashing service which unknowingly took for value from an intervening thief the plaintiff’s check, which the plaintiff had endorsed in blank and thus converted to a bearer instrument, was a holder in due course of the check, having received good title from the thief). Presumably, these results have occurred because the courts in New York have implicitly interpreted the undefined term “transfer” as utilized in [the pre-1990] U.C.C. § 3-202(1) as including the involuntary transfer of possession, so that as a practical matter the old Code (as still in effect in New York) has the same meaning as the new Model Uniform Commercial Code, which represents a clarification rather than a change in the law. [Where] the instrument entrusted to a dishonest messenger or agent was freely negotiable bearer paper…the drawee bank [cannot] be held liable for making payment to one presenting a negotiable instrument in bearer form who may properly be presumed to be a holder [citations omitted]. …Moreover, the plaintiff in the instant case knew that the voucher could be “Exchange[d] for cash.” The plaintiff conceded at trial that (1) when he himself utilized the voucher prior to its loss, no identity or ownership check was ever made; and (2) he nevertheless continued to use it. The plaintiff could therefore not contend that he had any expectation that the defendant had in place any safeguards against the voucher’s unencumbered use, or that he had taken any actions in reliance on the same. This Court is compelled to render judgment denying the plaintiff’s claim, and in favor of the defendant. Was the instrument in question a note or a draft? How did the court determine it was bearer paper? What would the racetrack have to have done if it wanted the machine to dispense order paper? What confusion arose from the UCC’s pre-1990 use of the words “transfer” and “delivery,” which was clarified by the revised Article 3’s use of the phrase “transfer of possession”? Does this offer any insight into why the change was made? How had—have—the New York courts decided the question as to whether a thief could be a holder when the instrument was acquired from its previous owner involuntarily? Victory Clothing Co., Inc. v. Wachovia Bank, N.A. This is a subrogation action brought by the insurance carrier for plaintiff Victory Clothing, Inc. (“Victory”), to recover funds paid to Victory under an insurance policy. This matter arises out of thefts from Victory’s commercial checking account by its office manager and bookkeeper, Jeanette Lunny (“Lunny”). Lunny was employed by Victory for approximately twenty-four (24) years until she resigned in May 2003. From August 2001 through May 2003, Lunny deposited approximately two hundred (200) checks drawn on Victory’s corporate account totaling $188,273.00 into her personal checking account at defendant Wachovia Bank (“Wachovia”). Lunny’s scheme called for engaging in “double forgeries” (discussed infra). Lunny would prepare the checks in the company’s computer system, and make the checks payable to known vendors of Victory (e.g., Adidas, Sean John), to whom no money was actually owed. The checks were for dollar amounts that were consistent with the legitimate checks to those vendors. She would then forge the signature of Victory’s owner, Mark Rosenfeld (“Rosenfeld”), on the front of the check, and then forge the indorsement of the unintended payee (Victory’s various vendors) on the reverse side of the check. The unauthorized checks were drawn on Victory’s bank account at Hudson Bank (the “drawee bank” or “payor bank”). After forging the indorsement of the payee, Lunny either indorsed the check with her name followed by her account number, or referenced her account number following the forged indorsement. She then deposited the funds into her personal bank account at Wachovia (the “depositary bank” or “collecting bank”). Rosenfeld reviewed the bank statements from Hudson Bank on a monthly basis. However, among other observable irregularities, he failed to detect that Lunny had forged his signature on approximately two hundred (200) checks. Nor did he have a procedure to match checks to invoices. (b) RIGHTS AND LIABILITIES.-For the purpose of determining the rights and liabilities of a person who, in good faith, pays an instrument or takes it for value or for collection, if an employer entrusted an employee with responsibility with respect to the instrument and the employee or a person acting in concert with the employee makes a fraudulent indorsement of the instrument, the indorsement is effective as the indorsement of the person to whom the instrument is payable if it is made in the name of that person. If the person paying the instrument or taking it for value or for collection fails to exercise ordinary care in paying or taking the instrument and that failure substantially contributes to loss resulting from the fraud, the person bearing the loss may recover from the person failing to exercise ordinary care to the extent the failure to exercise ordinary care contributed to the loss. In essence, Victory contends that Wachovia’s actions in accepting the checks payable to various businesses for deposit into Lunny’s personal account were commercially unreasonable, contrary to Wachovia’s own internal rules and regulations, and exhibited a want of ordinary care. If the person paying the instrument or taking it for value or for collection fails to exercise ordinary care in paying or taking the instrument and that failure substantially contributes to loss resulting from the fraud, the person bearing the loss may recover from the person failing to exercise ordinary care to the extent the failure to exercise ordinary care contributed to the loss. Wachovia argues that this section is applicable only in cases of forged indorsements, and not in double forgery situations. However, at least one court has found that the new revisions have made section 3-405 apply to double forgery situations. “Nothing in the [Revised UCC] statutory language indicates that, where the signature of the drawer is forged…the drawer is otherwise precluded from seeking recovery from a depositary bank under these sections” [Citation]…The Court finds the reasoning persuasive and holds that…Victory can maintain its cause of action against Wachovia. (1) Any person in possession of the instrument is its holder. The theory under the rule is that since the indorsement is “effective,” the drawee bank was justified in debiting the company’s account. Therefore, [Wachovia argues] the loss should fall on the company whose employee committed the fraud. …[However] under revised UCC §§ 3-404 and 3-405, the fictitious payee defense triggers principles of comparative fault, so a depositary bank’s own negligence may be considered by the trier of fact.…Therefore, based on the foregoing reasons, the fictitious payee defense does not help Wachovia in this case. Approximately two hundred (200) checks drawn on Victory’s corporate account were deposited into Lunny’s personal account at Wachovia. In 2001, Victory had approximately seventeen (17) employees, including Lunny. Lunny had been a bookkeeper for Victory from approximately 1982 until she resigned in May 2003. Rosenfeld never had any problems with Lunny’s bookkeeping before she resigned. Lunny exercised primary control over Victory’s bank accounts. Between 2001 and 2003, the checks that were generated to make payments to Victory’s vendors were all computerized checks generated by Lunny. No other Victory employee, other than Lunny, knew how to generate the computerized checks, including Rosenfeld. The fraudulent checks were made payable to known vendors of Victory in amounts that were consistent with previous legitimate checks to those vendors. After forging the indorsement of the payee, Lunny either indorsed the check with her name followed by her account number, or referenced her account number following the forged indorsement. About ten (10) out of approximately three hundred (300) checks each month were forged by Lunny and deposited into her personal account. Rosenfeld reviewed his bank statements from Hudson Bank on a monthly basis. Rosenfeld received copies of Victory’s cancelled checks from Hudson Bank on a monthly basis. However, the copies of the cancelled checks were not in their normal size; instead, they were smaller, with six checks (front and back side) on each page. The forged indorsements were written out in longhand, i.e., Lunny’s own handwriting, rather than a corporate stamped signature. Victory did not match its invoices for each check at the end of each month. An outside accounting firm performed quarterly reviews of Victory’s bookkeeping records, and then met with Rosenfeld. This review was not designed to pick up fraud or misappropriation. Based on the foregoing, the Court finds that Victory and Wachovia are comparatively negligent. With regard to Wachovia’s negligence, it is clear that Wachovia was negligent in violating its own rules in repeatedly depositing corporate checks into Lunny’s personal account at Wachovia. Standard commercial bank procedures dictate that a check made payable to a business be accepted only into a business checking account with the same title as the business. Had a single teller at Wachovia followed Wachovia’s rules, the fraud would have been detected as early as December 17, 2001, when the first fraudulently created non-personal payee check was presented for deposit into Lunny’s personal checking account. Instead, Wachovia permitted another one hundred and seventy-six (176) checks to be deposited into Lunny’s account after December 17, 2001. The Court finds that Wachovia failed to exercise ordinary care, and that failure substantially contributed to Victory’s loss resulting from the fraud. Therefore, the Court concludes that Wachovia is seventy (70) percent liable for Victory’s loss. Victory, on the other hand, was also negligent in its supervision of Lunny, and for not discovering the fraud for almost a two-year period. Rosenfeld received copies of the cancelled checks, albeit smaller in size, on a monthly basis from Hudson Bank. The copies of the checks displayed both the front and back of the checks. Rosenfeld was negligent in not recognizing his own forged signature on the front of the checks, as well as not spotting his own bookkeeper’s name and/or account number on the back of the checks (which appeared far too many times and on various “payees” checks to be seen as regular by a non-negligent business owner). Further, there were inadequate checks and balances in Victory’s record keeping process. For example, Victory could have ensured that it had an adequate segregation of duties, meaning that more than one person would be involved in any control activity. Here, Lunny exercised primary control over Victory’s bank accounts. Another Victory employee, or Rosenfeld himself, could have reviewed Lunny’s work. In addition, Victory could have increased the amount of authorization that was needed to perform certain transactions. For example, any check that was over a threshold monetary amount would have to be authorized by more than one individual. This would ensure an additional control on checks that were larger in amounts. Furthermore, Victory did not match its invoices for each check at the end of each month. When any check was created by Victory’s computer system, the value of the check was automatically assigned to a general ledger account before the check could be printed. The values in the general ledger account could have been reconciled at the end of each month with the actual checks and invoices. This would not have been overly burdensome or costly because Victory already had the computer system that could do this in place. Based on the foregoing, the Court concludes that Victory is also thirty (30) percent liable for the loss. For all the foregoing reasons, the Court finds that Wachovia is 70% liable and Victory is 30% liable for the $188,273.00 loss. Therefore, Victory Clothing Company, Inc. is awarded $131,791.10. How does the double-forgery scam work? What argument did Wachovia make as to why it should not be liable for the double forgeries? What argument did Wachovia make as to why it should not be liable under the fictitious payee rule? What change in the revised UCC (from the pre-1990 version) made Wachovia’s arguments invalid, in the court’s opinion? What factors appear to have caused the court to decide that Wachovia was more than twice as responsible for the embezzlement as Victory was? Wisner Elevator Company, Inc. [plaintiff] (“Wisner”), appeals from a summary judgment in favor of the defendant, Richland State Bank. At issue is the deposit of a check with a typed statement on the back directing that a portion of the funds be paid to a third party. We affirm the trial court judgment. PAY TO THE ORDER OF RICHLAND STATE BANK FOR ISSUANCE OF A CASHIER’S CHECK PAYABLE TO WISNER ELEVATOR IN THE AMOUNT OF $13,200.50 AND PAY THE BALANCE TO CHAD GILL IN THE AMOUNT OF $4,219.50. On July 23, 2001, the check was deposited into Gill’s checking account at Richland State Bank. Gill’s signature is found on the back of the check below the typed paragraph. No cashier check to Wisner Elevator was issued; instead the entire amount was deposited into Gill’s checking account as per Gill’s deposit ticket. …On May 28, 2002, Wisner filed suit against the bank, claiming that its failure to apply the funds as per the restrictive indorsement constituted a conversion of the portion of the check due to Wisner under UCC 3-206(c)(2) [that a depositary bank converts an instrument if it pays out on an indorsement “indicating a purpose of having the instrument collected for the indorser or for a particular account”]. An indorsement stating a condition to the right of the indorsee to receive payment does not affect the right of the indorsee to enforce the instrument. A person paying the instrument or taking it for value or collection may disregard the condition, and the rights and liabilities of that person are not affected by whether the condition has been fulfilled. …[T]he bank asserts the fault of the United States Treasury…, in failing to make the check payable to both Gill and Wisner. To the extent that the indorsement was conditional, the bank contends that it was unenforceable; to the extent that it was restrictive, it maintains that the restrictions were waived by the indorser when he deposited the full amount of the check into his own checking account. Wisner…[stated that it] was owed $13,200.50 by Gill for seeds, chemicals, crop supplies and agricultural seed technology fees. [It] further stated that Gill never paid the $13,200.50 he owed and that Wisner did not receive a cashier’s check issued in that amount by Richland State Bank.…According to [the bank teller], Gill asked to deposit the entire amount in his account. She further stated that the bank was unaware that the indorsement was written by someone other than Gill. Wisner contends that the trial court erred in holding that the bank could disregard what Wisner characterizes as a special and restrictive indorsement on the back of the check. It claims that under UCC 3-206, the amount paid by the bank had to be “applied consistently with” the indorsement and that the bank’s failure to comply with the indorsement made it liable to Wisner. According to Wisner, Gill was not entitled to deposit the amount due to Wisner by virtue of his own special indorsement and the bank converted the check under 3-420 by crediting the full amount to Gill’s account. The bank argues that the indorsement was conditional and thus could be ignored pursuant to 3-206(b). It also asserts that nothing on the check indicated that the indorsement was written by someone other than Gill. Since the check was made payable to Gill, the indorsement was not necessary to his title and could be ignored, struck out or simply waived. The bank also claims that Wisner had no ownership interest in the check, did not receive delivery of the check, and had no claim for conversion under 3-420. We agree with the bank that the true problem in this case is the failure of the government to issue the check jointly to Gill and Wisner as co-payees. Had the government done so, there would be no question as to Wisner’s entitlement to a portion of the proceeds from the check. “Indorsement” means a signature, other than that of a signer as maker, drawer, or acceptor, that alone or accompanied by other words is made on an instrument for the purpose of (i) negotiating the instrument, (ii) restricting payment of the instrument, or (iii) incurring indorser’s liability on the instrument, but regardless of the intent of the signer, a signature and its accompanying words is an indorsement unless the accompanying words, terms of the instrument, place of the signature, or other circumstances unambiguously indicate that the signature was made for a purpose other than indorsement. This paragraph was placed on the back of the check by the government as the maker or drawer of the check. Consequently, the bank argues that Gill as sole payee could waive, ignore or strike out the language. Although the Louisiana jurisprudence contains no similar case dealing with the Uniform Commercial Code, we may look to other jurisdictions for guidance…In [Citation, a New Jersey case] (1975), the drawer of a check placed instructions on the backs of several checks…that the instruments not be deposited until a specific future date. However, the payee presented some of the checks prior to the date specified on the back. The court found that the drawer did not have the capacity to indorse the instruments; as a result the typed instructions on the backs of the checks could not be indorsements. Instead, they were “merely requests to plaintiff who may or may not comply at its own pleasure. The instructions are neither binding on plaintiff nor the subsequent holders.” In other words, the payee could ignore the instructions. In the instant case, the payee did precisely that. Gill ignored the writing on the back of the check and instructed the teller at the defendant bank to do the same through verbal and written instructions. This Article does not displace the law of waiver as it may apply to restrictive indorsements. The circumstances under which a restrictive indorsement may be waived by the person who made it is not determined by this Article. In two cases arising under pre-UCC law, Louisiana recognized that indorsements could be ignored or struck out. In [Citation] (1925), the Louisiana Supreme Court held that the holder of a check could erase or strike out a restrictive indorsement on a check that was not necessary to the holder’s title. In [Citation] (1967), the court stated that an erroneous indorsement could be ignored and even struck out as unnecessary to the plaintiff’s title. Like the trial court, we find that when Gill affixed his signature under the writing on the back of the check, he made it his own indorsement. We further find that the indorsement was restrictive, not conditional. As Gill’s own restrictive indorsement, he could waive it and direct that the check, upon which he was designated as the sole payee, be deposited in his account in its entirety. Notice that the check was made payable to Chad Gill—he was the named payee on the front side of the check. To avoid the problems here, if the drawer (the US government) wanted to control the uses to which the check could be put, how should it have named the payee? The court held that when Gill “affixed his signature under the writing on the back of the check, he made it his own indorsement.” But why wasn’t it the indorsement of the drawer—the US government? If the language on the back was considered his own conditional indorsement (the instrument was not valid unless the stated conditions were met), how could the condition be disregarded by the bank? If it was his own restrictive indorsement, how could it be disregarded by the bank? What recourse does Wisner have now? Negotiation is the transfer of an instrument in such a form that the transferee becomes a holder. There are various methods for doing so; if the procedures are not properly adhered to, the transfer is only an assignment. An instrument payable to the order of someone must be negotiated by indorsement and delivery to the transferee. The indorsement must convey the entire instrument. An instrument payable to bearer may be negotiated simply by delivery to the transferee. Those who sign the instrument have made a contract and are liable for its breach. Makers and acceptors are primary parties and are liable to pay the instrument. Drawers and indorsers are secondary parties and are conditionally liable. Signatories are liable under a warranty theory. Various forms of indorsement are possible: blank or special, restrictive or unrestrictive, qualified or unqualified. Mal, a minor, purchased a stereo from Howard for $425 and gave Howard a negotiable note in that amount. Tanker, a thief, stole the note from Howard, indorsed Howard’s signature and sold the note to Betty. Betty then sold the note to Carl; she did not indorse it. Carl was unable to collect on the note because Mal disaffirmed the contract. Is Betty liable to Carl on a contract or warranty theory? Why? Would the result in Exercise 1 be different if Betty had given a qualified indorsement? Explain. Alphonse received a check one Friday from his employer and cashed the check at his favorite tavern, using a blank indorsement. After the tavern closed that evening, the owner, in reviewing the receipts for the evening, became concerned that if the check was stolen and cashed by a thief, the loss would fall on the tavern. Is this concern justified? What can the owner of the tavern do for protection? Martha owns a sporting goods store. She employs a bookkeeper, Bob, who is authorized to indorse checks received by the store and to deposit them in the store’s bank account at Second Bank. Instead of depositing all the checks, Bob cashes some of them and uses the proceeds for personal purposes. Martha sues the bank for her loss, claiming that the bank should have deposited the money in the store’s account rather than paying Bob. Is the bank liable? Explain. Daniel worked as a writer in order to support himself and his wife while she earned her MBA degree. Daniel’s paychecks were important, as the couple had no other source of income. One day, Daniel drove to Old Faithful State Bank to deposit his paycheck. Standing at a counter, he indorsed the check with a blank indorsement and then proceeded to fill out a deposit slip. While he was completing the slip, a thief stole the check and cashed it. Whose loss? How could the loss be avoided? You are the branch manager of a bank. A well-respected local attorney walks into the bank with a check for $100,000 that he wants to deposit in the general account his firm has at your bank. The payee on the check is an elderly widow, Hilda Jones, who received the check from the profit-sharing plan of her deceased husband, Horatio Jones. The widow indorsed the check “Pay to the order of the estate of Horatio Jones. Hilda Jones.” The attorney produces court documents showing that he is the executor of the estate. After the attorney indorses the check, you deposit the check in the attorney’s account. The attorney later withdraws the $100,000 and spends it on a pleasure trip, in violation of his duties as executor. Discuss the bank’s liability. Stephanie borrows $50,000 from Ginny and gives Ginny a negotiable note in that amount. Ginny sells the note to Roe for $45,000. Ginny’s indorsement reads, “For valuable consideration, I assign all of my rights in this note to Roe. Ginny.” When Stephanie refuses to pay the note and skips town, Roe demands payment from Ginny, claiming contract liability on the basis of her signature. Ginny argues that she is not liable because the indorsement is qualified by the language she used on the note. Who is correct? Explain. The state of California issued a check that read, “To Alberto Cruz and Roberta Gonzales.” Alberto endorsed it “Pay to the order of Olivia Cruz.” What rights does Olivia get in the instrument? Bill’s weekly paycheck was stolen by a thief. The thief indorsed Bill’s name and cashed the check at the drawee bank before Bill’s employer had time to stop payment. May the drawee bank charge this payment against the drawer’s account? Explain. Would the result change in (a) if Bill had carelessly left his check where it could easily be picked up by the thief? Explain. Would the result change in (a) if the bank had specific regulations that tellers were not to cash any check without examining the identification of the person asking for cash? Would the result change if Bill’s employer had carelessly left the check where it could be found by the thief?